Advertise in the 2019 Program Book. When businesses and companies show their support for Union Avenue Opera they gain the loyal patronage of our audience (450+ nightly) and show the community they are dedicated supporters of the arts in St. Louis. Our Twenty-Fifth Anniversary Season opens with the return of world-renowned soprano Christine Brewer in Bernstein’s comedic farce, Candide in a colorful spectacle not to be missed. Puccini’s operatic blockbuster La bohème opens at the end of July and is perhaps the greatest love story ever sung. Closing the season is a story of unimaginable bravery and the nature of hope in the true story of America’s longest held prisoner of war in Tom Cipullo’s Glory Denied. 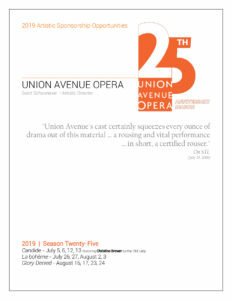 An ad in Union Avenue Opera’s program book will expose you to approximately 5000 audience members throughout the season. 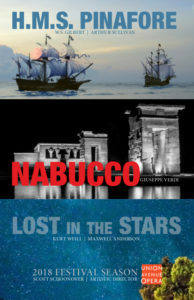 For twenty-four years, Union Avenue Opera has brought vibrant, professional opera in original languages to music and theater lovers throughout the St. Louis metropolitan area. Join us for the excitement of season twenty-five! Email emily[at]unionavenueopera.org with any questions or to place your reservation today. Make an impact – become an Artistic Sponsor. 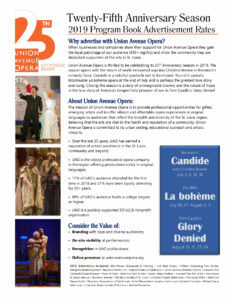 Union Avenue Opera offers a variety of Artistic Sponsorship opportunities ranging from Production Sponsor to Costume Sponsor, Supertitle Sponsor to Principal Artist Sponsor, and so much more. Sponsorship packages can be customized to meet your philanthropic and business goals. Download the 2019 Artistic Sponsorship Opportunities today and contact Administrative Director, Emily DePauw Stolarski to secure your sponsorship for the 2019 Festival Season. View the 2018 Festival Season Program online and see how your company can stand out among the crowd.